In the beginning of 2017 we thought we may have another year of Ed Sheeran’s “Thinking Out Loud,” but looks we have a new winner this year. The wedding couples have spoken. We can help guide our clients if they are in need of song suggestions. The song of the year isn’t new. It was released in 2008. This popular tune is clean, upbeat, with appropriate lyrics for all ages. Even your great-grandmother would enjoy this hit. Just in case you need some backups we have included runner ups for 2017 on our list. 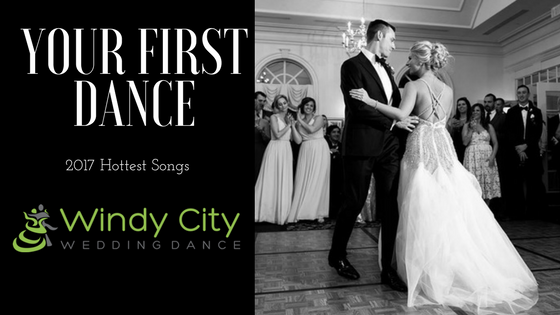 Here are the 2017 Hottest Wedding Dance Songs starting with the most popular. What is so unique about this tune? Wedding couples like the lyrics and the energy of the song. The album Gossip in The Grain was released by American folk singer-songwriter back in 2008. It’s been featured in the movie “Bad Moms,” released in 2016. The song hit number 5 on Billboard’s Adult Alternative Songs chart and number 1 in our dance studio in 2017. The last 2 years we have been playing Ed Sheeran on repeat, but our new leader is holding strong. Our couples call it a classic which means that Frank Sinatra is here to stay. Even though we hear Frank all year he’s welcome anytime. The song is a true American Foxtrot. An alternative to dancing Foxtrot is using Rumba patterns. If you’re not impressed with these 2 dance styles consider dancing Single Time East Coast Swing. This classic was released in 1961 and became another top Billboard Hit. Don’t count out our country fans from the list. Multiple wedding clients have requested this fun hit for 2017. We love teaching the dance style Texas 2 Step or Night Club 2 Step to this upbeat song. This tune was released in 2009 from the Album The Foundation. The lyrics are romantic and sweet and the music is upbeat. The song hit number 2 on Us Hot Country Songs Billboard’s list. Well watch out Ray LaMontagne, I have a feeling this romantic song will be on your heals shortly. Requested weekly, this song provides a fun story with the same kind of feel as Ed Sheeran’s “Thinking Out Loud.” If Lyrics are important to you on your wedding day, then you will appreciate this song. We’ve used numerous dance styles with this song. A typical go to is American Rumba. This wedding hit was recorded and released in 2011 and started take america by storm when featured in the The Twilight Saga – breaking Dawn. Still a studio favorite this song’s true dance definition and beat structure is Viennese Waltz. The Viennese Waltz can be a very difficult dance. Modifications can be made and we can use hesitation timing in order to accomplish a beautiful wedding dance at an appropriate skill level for new dancers. James Taylor has an album full of great hits. This James Taylor tune makes its way to the dance studio several times a year. The beat is easy to hear and great for beginners who want to move to a comfortable pace. Your entire guest lit should be familiar. Lately this song has been cycling through our speakers. The lyrics are beautiful and romantic. I’ve taught several dance styles to this song. Night Club 2 Step and Bolero both work with the speed and percussion. If you are thinking more about a slow dance then Bolero works best. Heartland just nails the lyrics and every daughter who ever dreamed of gliding across the dance floor with her dad has found the perfect song. This is another Viennese Waltz and can be easily slowed down with hesitation timing. Well take a guess which style of dance can be used with Cinderella. Yes that’s correct! It’s another Viennese Waltz. This is a fun song full of love. Sweep across the floor with your dad or daughter when dancing to Cinderella.